Building backlinks, creating content, and targeting new keywords all takes several months of waiting before you see a noticeable difference in organic traffic. Unlike paid ads that bring you traffic on the day of launch, SEO is a long-term strategy that needs time to compound. 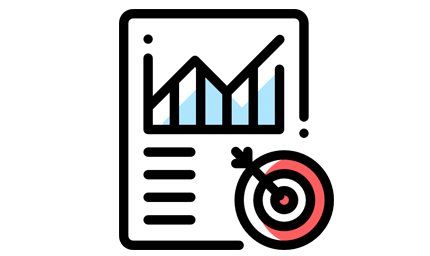 But what if I told you there was a way to improve your search engine results page (SERP) rankings in just a few weeks by updating old content? Google likes fresh content as it’s more relevant to the user. They have gone on record to state that they have a freshness algorithm that impacts around 35% of searches. Updating old content can see pages shoot up several search positions in a matter of weeks, and in this article, we’re going to teach you how. The first step is to find web pages that have room for improvement. You can do this by using Google Webmasters. 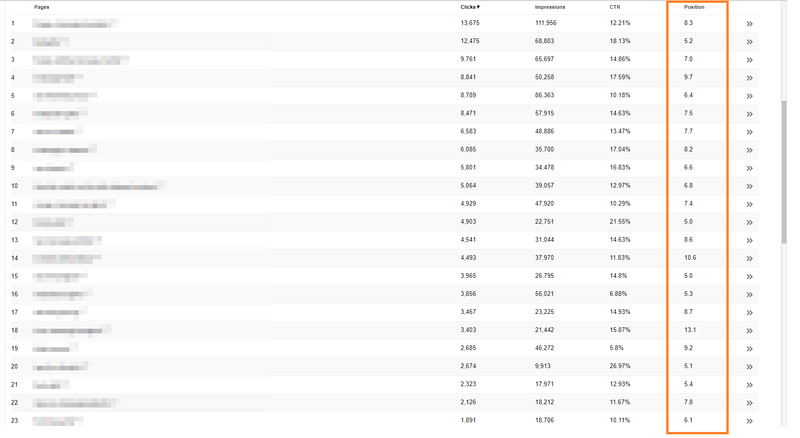 Google Webmasters’ tools will list every page on your site and where it currently sits on the SERP. Google lists 10 search listings per page. I’d start by focusing on pages that are in the 10-30 position range (page two and three on Google search), as 91.5% of searchers don’t go past the first page. 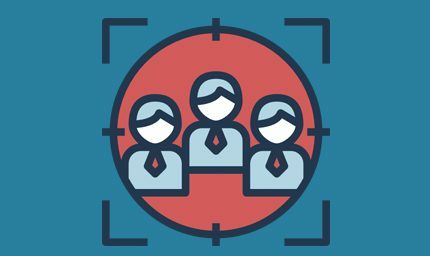 Gather a list of 10 pages that are in that region and then follow the tips below to update them. 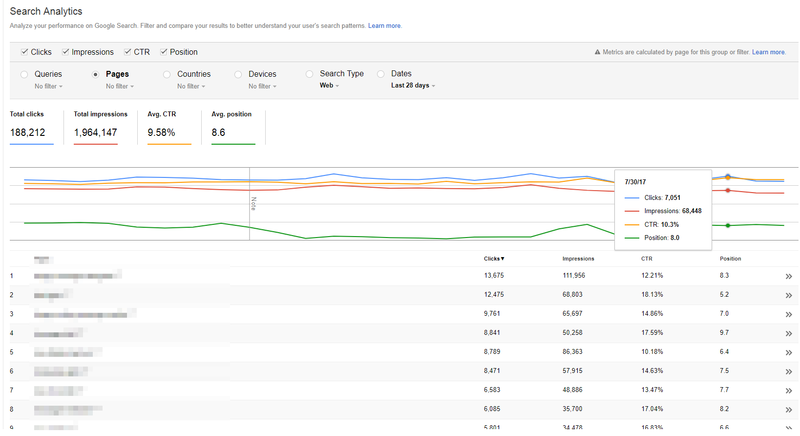 Remember, Google is a complicated beast so when you update old content, its rankings can go down as well as up and are likely to fluctuate a little until it settles. Google uses a number of other factors (not just freshness), such as time spent on the page, CTR, and impressions, to determine the quality of your update, so don’t assume your pages will go up after an update. 1. 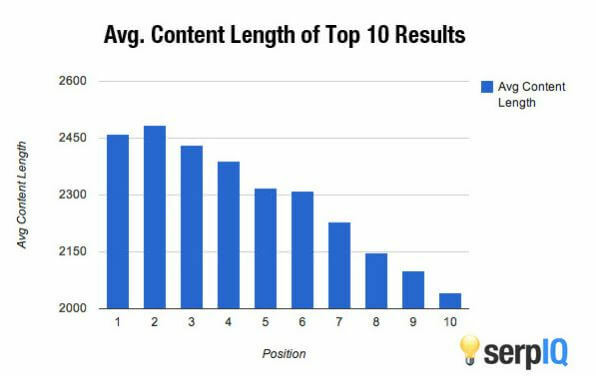 More content (on-page) – Ultimately, the best content (in theory) ranks at the top of the search, so adding more content to your pages is going to help. SerpIQ found that the more words on a webpage, the higher its ranking on Google. How many words is enough? Type in the keyword you’re ranking for, click on the first three articles ranked in Google and copy and paste the content into a Word document. 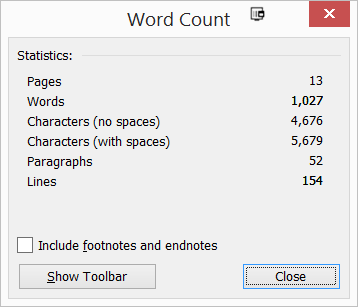 Then check the word count. Find the mean average between the three pages, and then ensure your page has 10-15% more words. 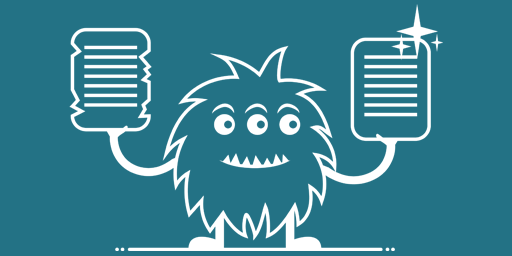 Again, you don’t want to update your content with fluff, so read other pages and blog comments that discuss your topic, and search for recent news stories to give you some ideas on what to add. Content is not limited to text, so add more images and videos if they are relevant. Google crawl robots do factor in image and video content when re-crawling your page. 2. Add more keywords (on-page) – Since your last update, you may have come across new long-tail keywords to target that you didn’t know about before. 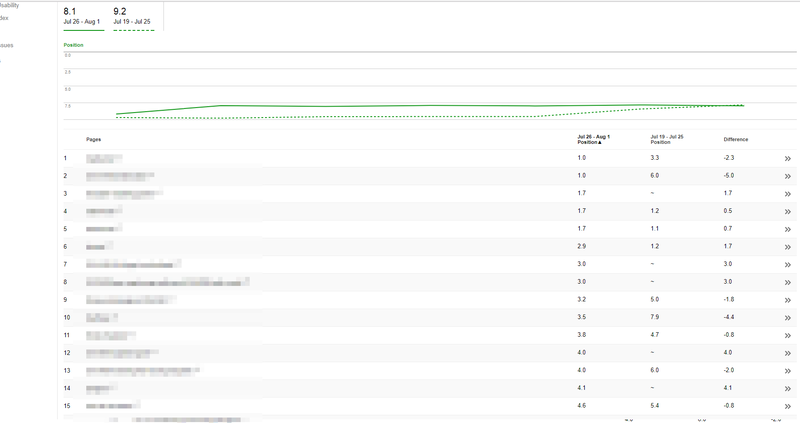 We don’t suggest changing the seed keyword of the page as that will cause a lot of ranking volatility, but adding a few more long-tail keywords will help you to get more hits. 3. Update the meta (off-page) – Your listing click-through rate does influence how the page ranks on Google. Type your keyword into Google and review your page title and meta description against your competitors’. 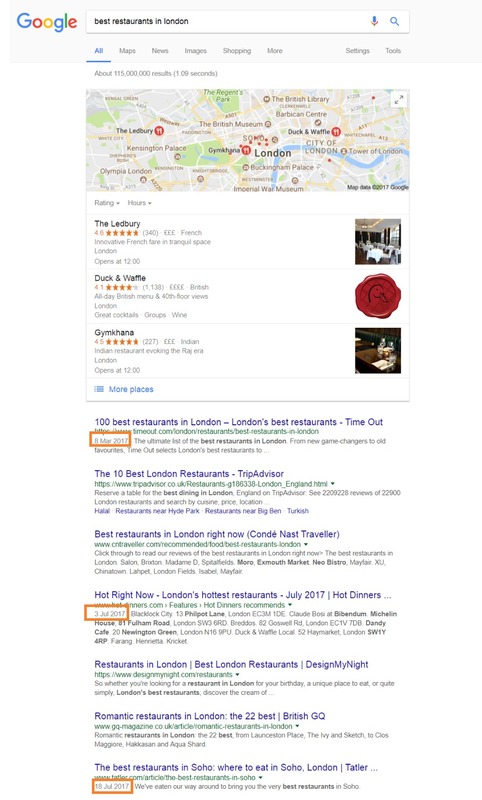 Check your copy against theirs and ask yourself which of the two links provides more context for the keyword searched for. The problem-solution method works well for meta descriptions. The first meta description from bodybuilding.com is great, as it states the problem (being skinny) and the solution (nine muscle gaining tips). The second listing doesn’t really hit home as hard, as chances are most people searching aren’t at 8% body fat, and the copy isn’t compelling enough to click. If you follow these three simple tips, you’ll have updated your on-page and off-page SEO. If the answer is no, then don’t add it. Simple. It’s not good practice to add content for content sake but instead, add content that will add value to the user. If the answer is no, then keep working on it but remember to keep it clear, concise and short enough to be within the character limit that Google displays. If you update your pages and leave it at that, Google can take weeks or months before revisiting your website and re-crawling your pages. Within the Google Webmasters service, there is a tool called Google Fetch, which allows you to resubmit pages to Google for faster indexing. You simply enter Google to reindex and click the ‘Fetch’ button. 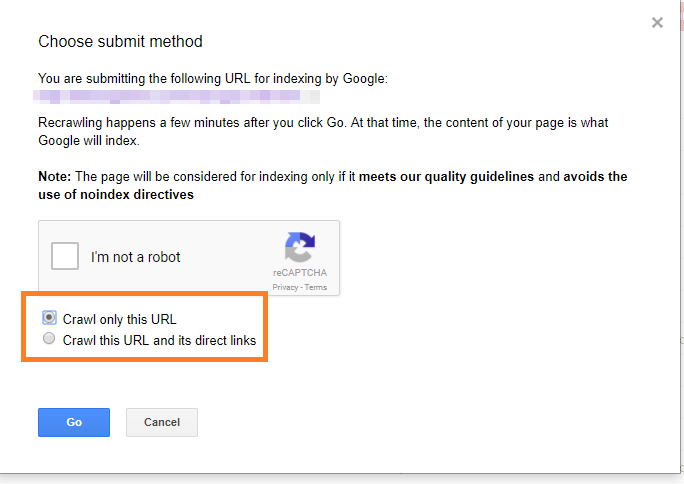 Crawl only this URL – This option tells Google to only index the page suggested. It will not re-crawl internal and external links (you get 500 of these per month). 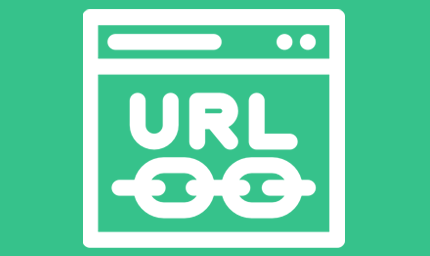 Crawl this URL and its direct links – This option will re-crawl your URL and every link on the page that has the do-follow attribute (you get 10 of these per month). Since you have only updated a single page, select the ‘Crawl only this URL’ option and hit the ‘Go’ button. From my own experience, Google will re-crawl your page pretty quickly (sometimes instantly), but it can take anywhere from a day to a week. By using Google Webmasters, you can monitor the progress of your updated pages by using the ‘Dates’ function and comparing the rankings by date. You’ll need to wait 2-4 weeks from when Google re-crawls your page to gauge the results. SEO isn’t just about creating new content; work done in the past needs to be revisited and updated to remain relevant for today’s search. 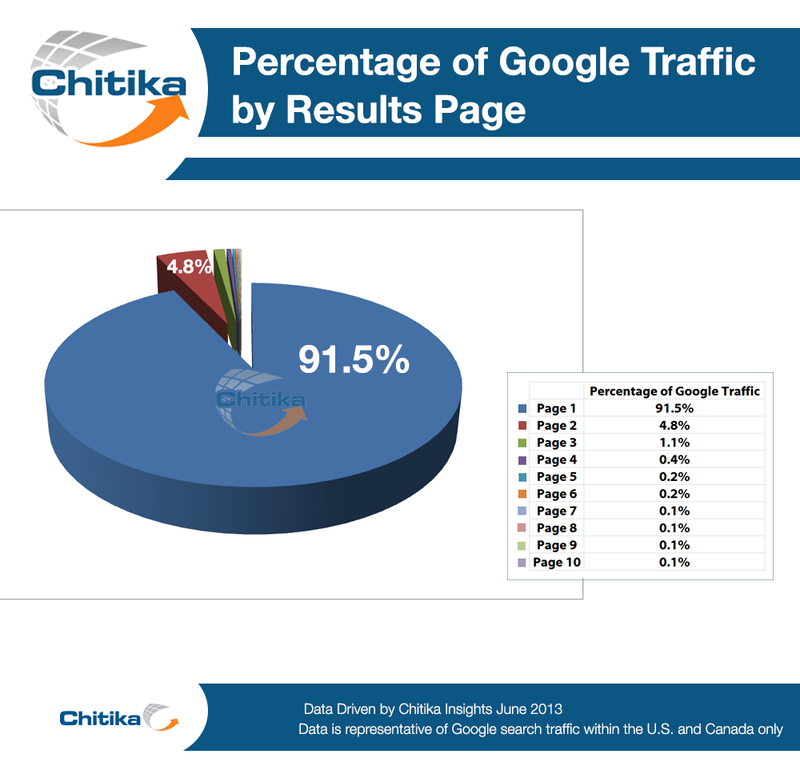 The Google search engine is a dynamic ecosystem, with page rankings that change all the time. If you don’t update older pages, then over time they will be pushed down further. 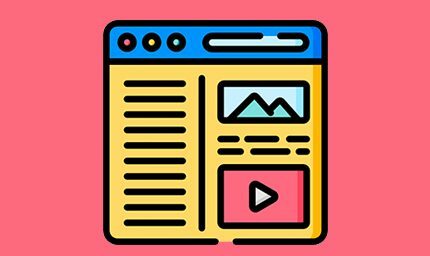 When was the last time you refreshed the content on your site?